The Egyptian military exercised special influence and after Mubarek’s removal became the sole authority, responsible for extensive human rights abuses. The Egyptian military routinely responded to peaceful protests with excessive force. Photo (c) Mahmud Hams / AFP. Between its removal of Mubarak as Egypt’s president on February 11, 2011, and January 2012, Egypt’s Supreme Council of the Armed Forces [SCAF] was “the sole authority” in Egypt “with the power to amend or approve amendments to existing laws, and issue or approve new ones,” and people in Egypt “experienced many of the same human rights abuses that characterized Mubarak’s police state” which the SCAF justified “by noting that they [were] authorized under existing laws,” according to a Human Rights Watch press release of January 2012. 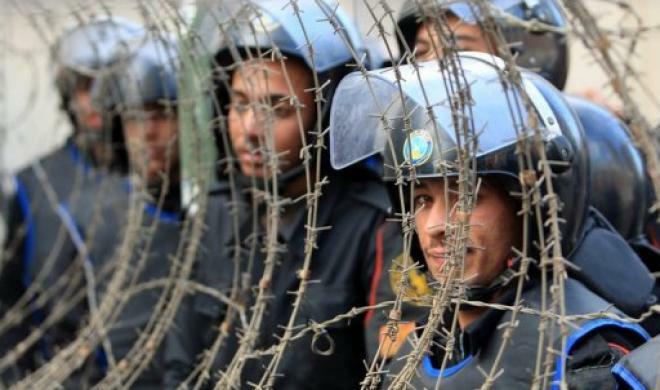 The SCAF promised to lift the state of emergency, in effect continuously for the past 30 years. But on Sept. 10  the SCAF expanded its scope of application beyond its use under Mubarak… Military courts have tried over 12,000 civilians in the past year. This entry was posted in RagBlog and tagged Bob Feldman, Egyptian History, Egyptian Military, Hosni Mubarak, Human Rights Watch, People's History of Egypt, Rag Bloggers, World History. Bookmark the permalink.